For an exhibition like Lyonel Feininger: From Manhattan to the Bauhaus, the greatest danger isn't incoherence, or sprawl, or over-ambition. It's that everything might cohere a little too methodically. In this eighty or so years of artistic activity-an eighty years that included forays into painting, cartooning, photography, musical composition, and toy design-Feininger displayed a versatility and adaptability that even the most involved showcase might not effectively capture. Yet there are also a few ideals that Feininger, for all his shiftings, never really left behind: the importance of precise observation and precise draughtsmanship, the opposition between imagination and materialism, the persistence of figuration in an age of increasingly abstract art. Any one of these ideas could be a thesis waiting to happen, and any one of Feininger's decided preoccupations or chosen media could easily form the center of a fine, thoughtful retrospective. Still, I can't help feeling that strictly-imposed limits would do scant justice to Feininger's voracious artistic psyche. And I can't help feeling that a thesis-oriented exhibition would defeat the moments of discovery that are one of the principal attractions of the Montreal Museum of Fine Art's latest offering. If, like me, you have long regarded Feininger's canvases as mere footnotes to better-known developments in international modernism, you should be prepared to have your attitudes revised for the better. And this is where the extensiveness of Lyonel Feininger: From Manhattan to the Bauhaus is a frequent blessing. Since none of Feininger's many, many compositional strategies have entered the art historical canon in quite the manner that Cubism or Surrealism or Abstract Expressionism has, it is possible to appreciate his evolution in a way that is no longer viable with Picasso or Dali or Jackson Pollock. It is possible to try to figure him out almost from the ground up, rather than alighting upon common-consensus breakthroughs or masterpieces. 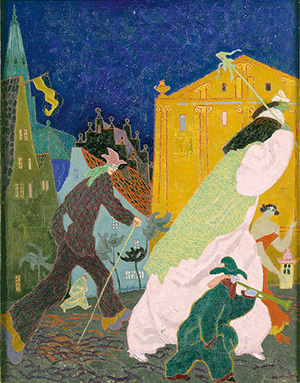 Although there are some very necessary efforts to place the American-born, Germany-based Feininger in a cosmopolitan artistic milieu, Lyonel Feininger: From Manhattan to the Bauhaus is much more valuable as a forum for contemplating and comparing the individual strengths of Feininger's creations. Actually, the show can be least interesting when Feininger's contemporaries are onstage. There is plenty of Bauhaus background information at visitors' disposal, including Frank Whitford's documentary Bauhaus-The Face of the 20th Century. Yet there isn't much of a chance to view Feininger's works alongside the accomplishments of the revolutionary art school's other instructors, who are represented by a single wall of relatively small paintings. (The press materials repeatedly compare Feininger to Bauhaus luminaries Paul Klee and Wassily Kandinsky. I would have appreciated a better basis for making the comparison on my own.) Fortunately, for every small disappointment of this sort, the MMFA delivers a major satisfaction. Bauhaus aficionados, myself included, can take consolation in the exhibition space's overall layout-a layout that riffs noticeably, but not sycophantically, on the Bauhaus aesthetic of simple geometries and single-color expanses. But those color expanses are also perfectly designed for presenting two-tone photographs. Feininger has a few of these on display, but his son Andreas has an entire gallery of black-and-white shots, which show to excellent effect against the Museum's berry-red and rubber-yellow backdrops. 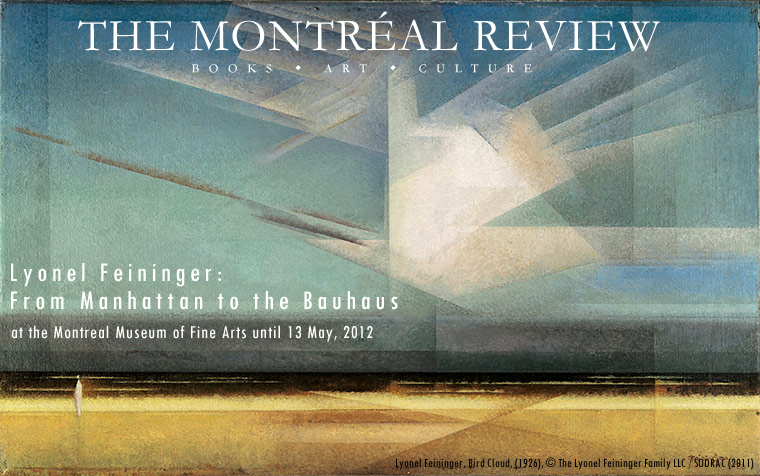 In a different, but equally intriguing way, the slanted, colored gallery walls set a perfect atmosphere for the first grouping of works on display: the pre-WWI newspaper and magazine cartoons that brought Feininger his earliest measure of fame. A white, rectilinear room just wouldn't seem like the right habitat for Feininger's jaunty, angular characters and his playful, haphazard narratives. Playfulness aside, one cannot dismiss Feininger's cartoons as mere hackwork, and compositions such as "The Furious Locomotive" (1904) and "The Child-Murderess" (1906) strike me as both more lurid and more accomplished than Feininger's early oils. Though Feininger produced some delectable canvases during his first decade of "serious" painting, much of his pre-1920s work owes obvious debts to well-established styles: Fauvism, German Expressionism, Analytic Cubism. His use of pictorial space is often confident, his color schemes are often memorable. Even Henri Matisse, the most radical Fauve of them all, thought Feininger's Green Bridge (1909) an intimidatingly radical invention. Yet, strange for a modernist, Feininger never excelled at painting motion or dynamism. His paintings of hurrying pedestrians and carnival crowds are, often, most remarkable for their smallest details. It is tempting to dismiss paintings such as Carnival (1909) and Newspaper Readers (1909) as explorations of themes that Expressionists like Kirchner explored with happier results-at least until you notice the figures' tiny, impish faces. Pure Feininger. By the late 1910s, Feininger was well on his way to one of his better-known mature styles, a serene, translucent, landscape-oriented mode that Feininger termed "Prism-ism." Indeed, a style like this is in perpetual danger of becoming too pretty for its own good. One of the main attractions of Feininger's painting from the 1920s and 1930s is its incorporation of calculated dissonance, its unwillingness to be as easy on the eyes as it might have been. Feininger fostered this spirit of challenge by enlisting his airy prisms in the depiction of some remarkably substantial subjects: viaducts, bridges, apartment blocks, and, in some of his most absorbing canvases, churches and cathedrals. After Feininger fled Germany for New York in 1937, his painting became more monumental, yet more cautious too. At first glance, you will probably be roused by the coruscating seascape Sunset Fires (1953). At second glance, you might realize that this three foot-long canvas is a homage (and a too-faithful, self-defeating homage) to J.M.W. Turner. Other of the MMFA's late-period selections, though, do something different. They initially appear unassuming, then reveal themselves for the stunning compositions they are. Manhattan, Night (1940) looks at first like a simplistic study of the perspective down a depopulated thoroughfare. Look closer, and you'll notice the jagged contours of Feininger's buildings, unevennesses of Feininger's grid windows, and all the other touches that make this deceptively simple scene the lovely, melancholy invention it is. Paintings like this deserve protracted contemplation. Yet, for whatever reason, the MMFA burdened Feininger's valedictory gallery with not one, but two distractions-namely, a recording of Feininger's fugues, and video footage of the Nazis' Degenerate Art Exhibition. That said, small missteps like these are preferable to the tremendous wrong turns that this exhibition could have taken. At no point does Lyonel Feininger: From Manhattan to the Bauhaus try to work itself up into a spirit of distracting triumphalism, and at no point is Feininger's importance blown totally out of proportion. Quite the opposite, in fact. In their catalogue introduction, Adam D. Weinberg and Nathalie Bondil wonder if "the calm, quiet, and unassuming character of his work has caused it to be missed or dismissed. Perhaps the hushed, spiritual qualities he prized in his work seem unfashionable today." And in his catalogue essay on Feininger's fame in Germany, Ulrich Luckhardt notes that "Feininger's art was popularized in calendars, art prints, and postcards and thereby made accessible to the broader public." In other words, in terms of reception, Feininger may well be stuck in an artistic limbo. He has a measure of prominence, but not the domineering quality of a Picasso, a Malevich, or even that other great gentleman of modernism, Henri Matisse. He's found a place on postcards and calendars, but has yet to capture the public imagination. But this mellow modernist can astound. 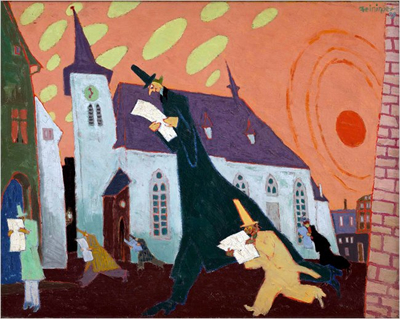 There are passages of sublimely controlled draughtsmanship in Feininger's corpus, and if Lyonel Feininger: From Manhattan to the Bauhaus had consisted of nothing more than a white wall and the Church of St. Mary at Night (1931) I still would have visited. However, in a happy paradox, the breadth and variety of this showcase prove to be aids to reflection, aids to understanding the specific nature of Feininger's "hushed, spiritual qualities." As early as 1906, Feininger was preoccupied with the power of the imagination to find offbeat associations in everyday surroundings. Such associations are central to his comic strip Wee Willie Winkie's World, a series devoted to a single small boy who re-imagines houses, clouds, and trees as towering human and animal forms. And something of the same impulse to find fantastical companions in nature at its most impersonal reappears-without narrative, without humor, and with a very different kind of poignancy and grandeur-in the 1926 painting The Bird Cloud. I hope I haven't spoiled anything. 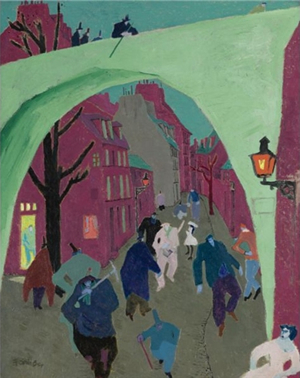 Yet Lyonel Feininger: From Manhattan to the Bauhaus abounds in such moments of subtle self-reinvention. Just when you think you've figured Feininger out, and think you've figured out why he isn't sitting among the highest echelons of 20th-century painting, he confronts you with some new gesture of genius.